Fuchsia might just be one of Esoteric’s most intriguing releases! Formed in 1971 at Exeter University, this prog folk outfit was made up of six students in total, three boys and three girls. The boys played on rock instruments while the girls formed a string trio, creating a most unique and unusual sound falling somewhere between the baroque rock of early Electric Light Orchestra and the manic folk of Jan Dukes de Grey. The first listen of this album is a peculiar one. From the album cover, one expects a lot of dark folk, perhaps not so polished. And that’s exactly what you get, but also so much more! Although the instrumentation doesn’t vary from song to song, the atmosphere from each track is wildly different, taking the listener in disparate directions, showing the band’s creativity. All the while, the band has a very dense and complex sound, and listening from start to finish can actually be rather exhausting, but it’s certainly worth it. Perhaps to this end, the final two songs are much shorter and less involved than the previous five, with the previous four being over six minutes each; indeed, I’d assumed these were some “Bonus Single A and B Side” tracks that Esoteric had added for completists. Band leader Tony Durant insists that he “wanted to experiment with writing songs not to the normal pop format,” which seems rather par for the course with prog. However, more interestingly he “wanted to experiment making the string parts an integral part of the song itself, rather than something added to embellish the song once written.” It must be said, this album certainly couldn’t work as well without the strings; every time they are used, they don’t feel forced whatsoever, but are still an unexpected surprise on an album like this. For the band to be able to casually throw in a string section whenever they need to makes this album very refreshing indeed. It’s not at all like Yes’ Time and a Word, where you feel like you’re trying to listen past the orchestra to the band at times. As to the songs themselves, there are highlights galore. Gone with the Mouse introduces the band’s sound with a rocking prog excursion, replete with long-form instrumental and feminine vocals à la The Northettes. Things get very exciting towards the end, especially with the triplets on the drums underpinning the choral vocals. Later on, The Nothing Song seems to be the pinnacle of the album as well as being the longest track at eight and a half minutes. In full symphonic prog style, this song dramatically turns in many unpredictable directions during the instrumental sections whilst the verses contain nonsense lyrics that carry a sense of sarcasm. Lastly, the shorter Me and My Kite evokes the feel of Bike-era Syd Barrett, although the band don’t pull off this absurdist direction quite as well. If there are any complaints, it’s that occasionally Fuchsia are too complex for their own good. At eight minutes, A Tiny Book is a good example of this. For one thing, the band start with some great themes, but after four minutes the tone of the song is suddenly and unintentionally changed, and never quite brought back. The lyrics on this particular track also lose me somewhat, as they feel just a little too pretentious. This bit makes me laugh though: “She asked me if I thought that she had aged, I was not bound to answer in a way that made things easy”. Though I still disagree with the song’s structure, I will admit it has grown on me. To turn to Esoteric’s reissue, it’s difficult to know what to say. The sound definitely isn’t as clear as you’d like it; with all the complexity involved, the mix can seem a little murky. However there’s definitely some choppy editing going on, for example in the aforementioned triplets at 3:18 to 3:20 in Gone with the Mouse, where the drums seem to go in and out of the channel faster than a tourist who’s just realised the sea is just a bit too “bracing” at Brighton. Did I go too far there? Never mind. It’s possible that the poor sound quality is due to the band’s inexperience in the studio and not knowing what they wanted. With regards to the other aspects of this release, John O’Regan’s essay is informed and easy to read, with some rather eloquent words about the band – particularly their “gaucheness” – that put this review to shame. It doesn’t quite read chronologically though, as he mentions the album’s release before the band’s formation. Although interesting, it might not have been necessary for him to list each of the band members’ rather mundane whereabouts since the break-up of the band; the fact that violinist Janet Rogers “disappeared from public life” has left me feeling extremely curious about why she’s the only one out of six to have done so. Meanwhile, Durant has gone into writing jingles. Prog rock really is the gateway to the rock and roll lifestyle, eh? The last thing I’ll mention is that, while the album does indeed contain the full artwork as advertised, the keen eye of the collector will notice that there has definitely been some unnecessary digital jiggery pokery with Anne Marie Anderson’s striking cover illustration. The evidence is clear through comparison with the original LP, but I doubt I’ll ever know what affected this decision. That said, Fuchsia is still a pleasure to discover. As an Exeter alumnus, it’s very interesting to find out that my university spawned such a delightful band. I do share something else in common with the band; the band photo featured on their album sleeve was taken at Hampstead Heath, just a stone’s throw from where I now live. 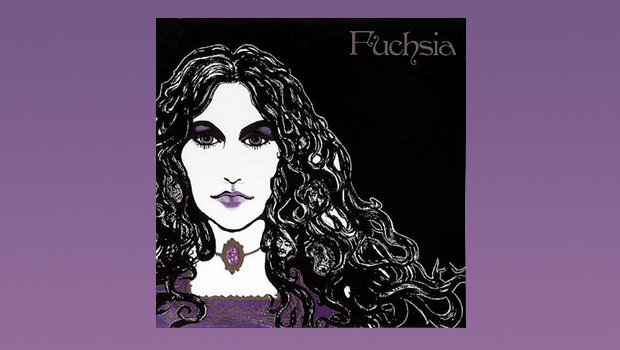 Surprisingly infectious, Fuchsia’s novel take on folk and progressive rock just goes to show that the well of inventive ’70s bands is utterly endless, and it’s up to Esoteric to keep digging them out for us. Let’s just hope they can keep up a high standard for their reissues!